We're having a raffle! 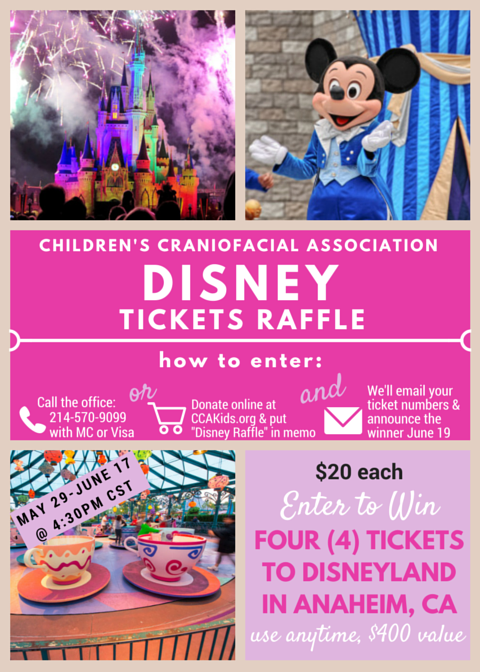 Thanks to a generous donation, we are able to offer up Four (4) Tickets to Disneyland Park in Anaheim, California, for raffle! You can enter by purchasing tickets. Tickets are $20 each. To purchase tickets, you can call the office (214-570-9099) with Visa or Mastercard credit and debit cards. Other forms of payment, including PayPal, are available through our DONATE button. To buy tickets online, simply use code "DISNEY RAFFLE" in the special instructions. Official Drawing on June 17, 2015 at 4:30pm. We'll announce the lucky winners to the world on June 19, 2015. These tickets will be held for you at Will Call after you select the dates you'd like to visit the park. Ticket sales end at 4:30PM CST on June 17, 2015. 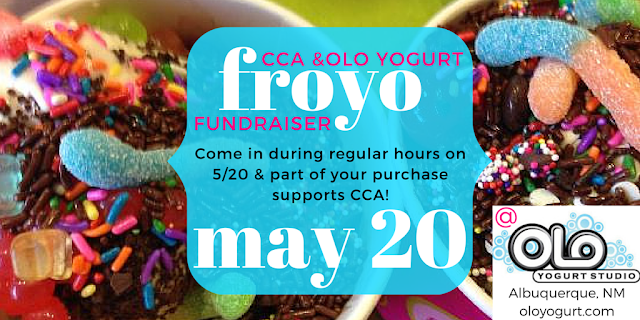 Official tickets must be purchased through the CCA office or our online donation portal. 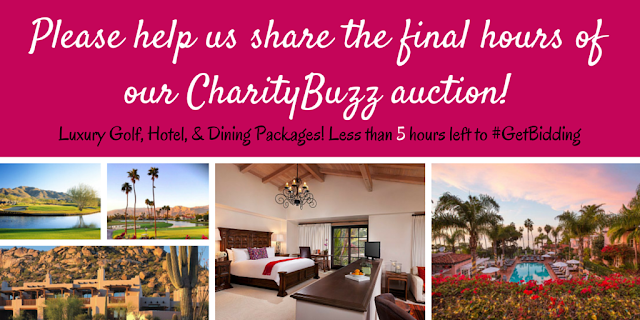 We expect all winning bidders and their guests to conduct themselves appropriately when attending this experience. Polite manners and respect for the generous donor and adherence to any rules or parameters are a must. This #ThankfulThursday, we're grateful to the #CherCrew - Cher's biggest fans - who raised over $4600 for CCA Kids in honor of Cher's birthday, which was May 20. WOW! We are so honored by your generosity and will use these funds to help more kids get scholarships to Retreat and financial assistance for quality medical care. Thank you! 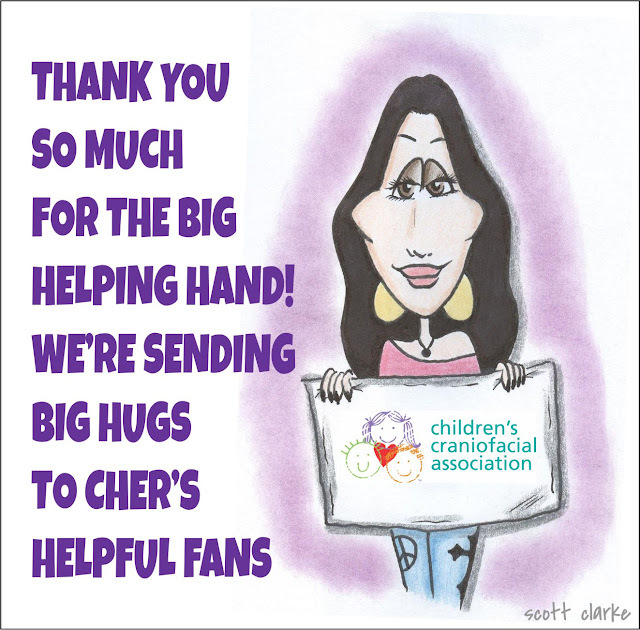 Also, thanks to Scott Clarke for making another fun Cher Toon for us. 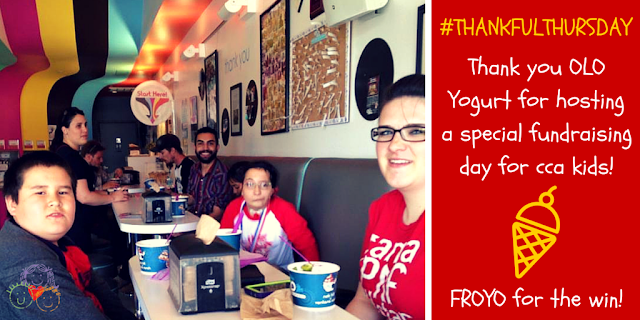 Giving back is the best way to celebrate life, so thank you all for your generosity and hard work. Check out this cool Prom Night Reunion for Hannah Twedt and Danny Pfeiffer, two friends who met Lentil at the CCA Orlando Retreat 2013. Hannah and Danny, you rocked prom! Thank you for sharing your exciting experience with us. 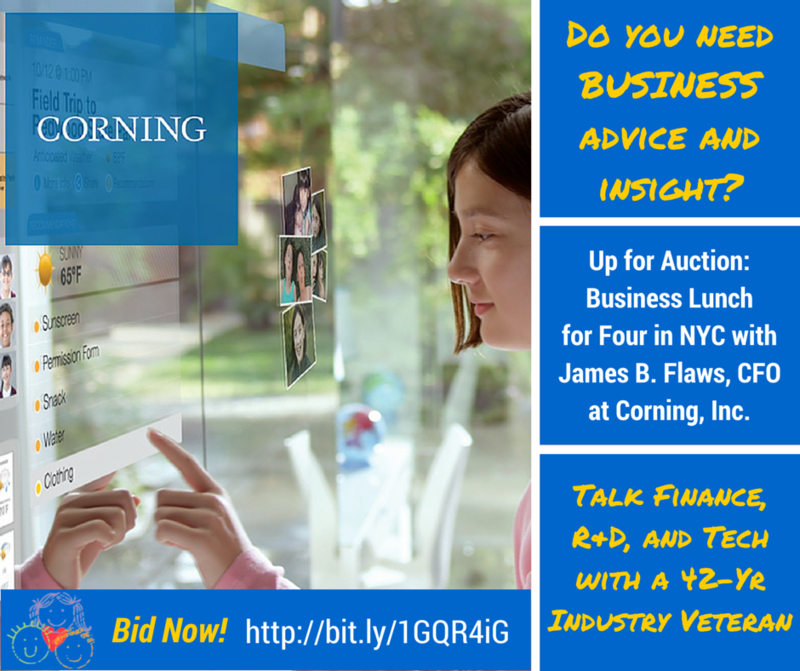 Today we are sending a BIG THANK YOU Josiah Torres, of EXHIB-IT!, and Olo Yogurt, who sponsored a special profit sharing day fundraiser yesterday. From the Facebook pics, it looks like it was a great day! Thank you for your generosity and enthusiasm for raising funds for our cranio warriors. OLO Yogurt was voted “Best Frozen Dessert” – 2013, 2012 & 2011 in the Best of Burque Restaurants, Alibi. If you would like to host a fundraiser for CCA, please contact Jill at the CCA office at (214) 570-9099. 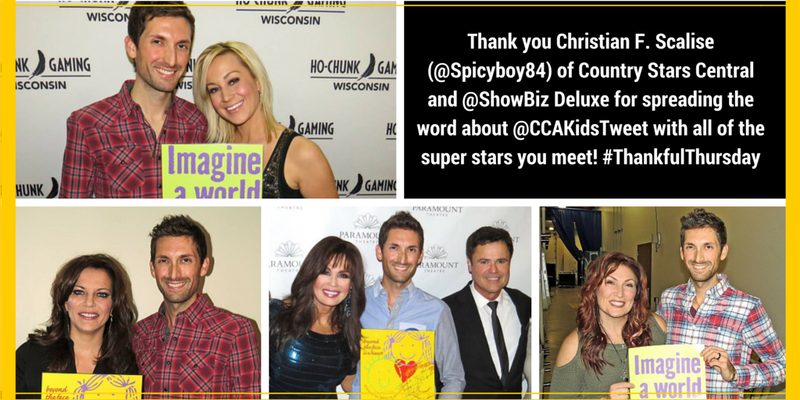 This #ThankfulThursday, CCA is thankful for our friend, Christian F. Scalise, of Country Stars Central and ShowBiz Deluxe for spreading the word about CCA Kids with everyone he meets! Yep, those smiling faces are (from left top to right bottom): Kellie Pickler, Martina McBride, Marie & Donny Osmond, & Jo Dee Messina! 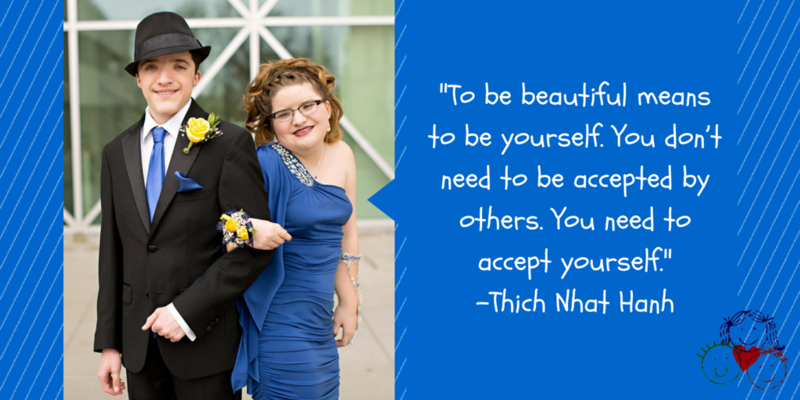 Thank you all for spreading the #ChooseKind message! Today we have a couple of stories from our bloggers... enjoy your day, and whatever this day means for you, we wish you all love, peace, and comfort. 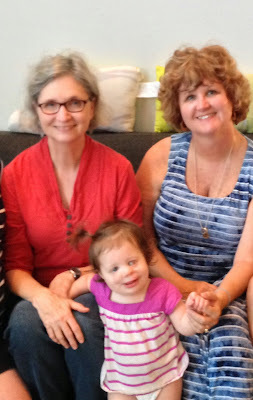 For mother's day this year, I would like to focus on the two women who love my daughter, Shierry, so fiercely that I pity anyone and anything who ever dares harm or even annoyance to Shierry in any way: my mom and my husband's mom. They are convinced and publicly proclaim on the regular that Shierry is the most genius, uproariously hilarious, and beautiful person ever. If Shierry believes in herself even one-tenth as much as her grandmothers believe in her, she will be unstoppable. They will read books or play outside way beyond the point at which I am capable of doing so. They always, always show up. Every difficult moment, birthday, and semi-annual pre-surgery pizza party. When you see Shierry with one of her grandmothers, you can't help but think that she is the luckiest girl in the world. We definitely would not be able to raise this crazy kid without them. Thank you and we love you! My favorite Mother's Day was last year when I took a long weekend off. I picked up my mom and we drove to Michigan - over four hours away - to visit my aunt (my mom's sister). I drove the whole time. 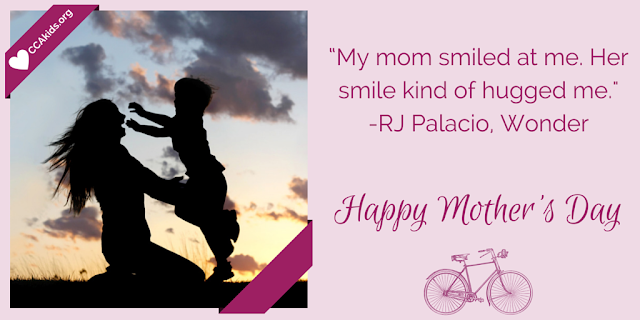 My mom dislikes driving, and I do too, but I would do anything for my mother ... especially on Mother's Day! We also celebrate my Aunt Connie on Mother's Day since there isn't a Aunt's Day. She was a foundational influence on me and in my life. So, my ladies and I went to the small town of Holland for a event called "Tulip Time." We got to see a sprawling acre of beautiful rainbow tulips and we didn't have to go a different country for it. We wrapped up a wonderful celebration by visiting Saugatuck to see Lake Michigan, the beach, and a having a very delicious dinner. Check out the event details and let everyone know you'll be there on our Facebook Event page. Junior High is an exciting, yet nerve-wracking time in an adolescent’s life. It’s a whole different world that comes with new opportunities and challenges. 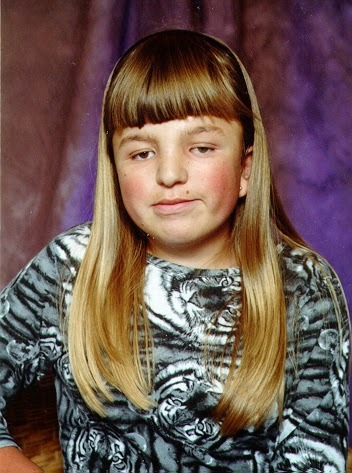 However, nothing could have prepared me for the challenge that I was about to face on my first day of Junior High…. First of all, I have to note that I was very fortunate in elementary school. I had many friends and everyone knew who I was. Every time I had surgery, I would receive get-well cards from all the classes. School was my safe place; I was sheltered from the stares and teasing. It was my escape from the discrimination I faced in the outside world. When I was 12 years old, it came time to enter a new school. I was more excited than nervous because I now had independence. Junior High felt so 'grown up.’ I also still felt safe because some of my friends from elementary school would be there. On the first day, we were assigned to our homeroom. I excitedly looked at my schedule and explored the hallways until I found the classroom. I’ll never forget how it felt when I first walked in. It suddenly became very quiet as all the students stopped talking and turned to look at me. I figured “oh they’re just looking because I’m the last one to walk in.” As I sat at a desk, I noticed that they weren't just looking -- they were actually staring at me. Some students were whispering to each other and snickering. I thought to myself “what is going on here? This has never happened in school before!” – what was once a safe place for me, would soon become a place that I hated. Not only was I stared at in class, but in the hallways as well. I remember that gnawing feeling I had in my stomach as I passed by the lockers. Students would be whispering, pointing and staring. I tried to ignore it and focus on the friends from my old elementary school. I figured the stares would eventually go away. Unfortunately, it continued on for weeks. Finally, I decided “enough is enough!” I couldn't take it anymore. I wanted to feel comfortable at school again. Therefore, I set up a meeting with the guidance counselor. I told her that how desperately I wanted everyone to know that I’m still the same as everyone else, even though I look different. Unsure of what to do, we went to see the principal. She suggested that I go in front of every class and talk about Pfeiffer Syndrome and answer any questions they might have. Some people might ask “Wow, weren't you shy to do that?” – Surprisingly, I wasn't nervous at all. I was so determined to speak up and show everyone the real me. I wanted them to see that there was nothing to be afraid of. The following day, the principal and I addressed our first class. It was intimidating to face the students, but I kept my head up high and proudly talked about my syndrome and what I’d been through. To my surprise, I got a very pleasant reaction from the students! They were interested in what I had to say and they asked many questions such as, “Does Pfeiffer Syndrome affect your intelligence?” (It does not.) I received the same positive reaction from all the classes. I began to realize that the students were not staring just to be mean … they were only curious. They were faced with the unfamiliar and they didn’t know how to react. They did not have the knowledge to understand why I looked different. When I went back to school the next day, my world was completely changed. Instead of getting stares and whispers; I got big smiles and waves, “Hi Sabrina!” – There was no more hesitation or wondering “Why does she look like that?” I made new friends and school became my safe place again. What would have happened if I never had the courage to speak up? Nothing. Nothing would have changed. I would have continued to be stared at. I would have spent my 2 years at Junior High being miserable. I am so thankful that I had the support of the principal who encouraged me to face the students. Once I educated them about Pfeiffer Syndrome, it was no longer unfamiliar to them. I told the students to never judge a book by its cover because it’s what on the inside that counts!